When they meet a Ugandan refugee girl who's an amazing designer, three trendy London teens combine their talents to create some kind of wonderful. A hip, cute, multiculti fashion fairy tale! Nonie's a freak for fashion. Bleeding-heart Edie wants to green the planet. And starter-starlet Jenny has just landed a small part in a big Hollywood blockbuster. But when these trendy London besties meet a Ugandan refugee girl named Crow, sketching a dress at the Victoria & Albert Museum, their worldview gets a makeover. As they learn about the serious situation in Crow's homeland, they decide to pool their talents to call attention to the crisis. One of Crow's designs on the red carpet at the Oscars--quelle chic way to raise awareness! Now...how to "make it work"?! Despite the old saying “Never judge a book by its cover,” a lot of readers do precisely that. 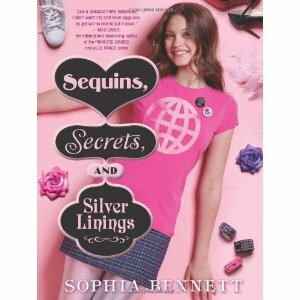 When I saw the cover of Sequins, Secrets and Silver Linings it looked like a fluffy read that would lift my spirits on a dreary afternoon. While this novel proved to be a fun book that any fashion obsessed reader will fall in love with, it also had much more substantial messages and themes. The story is set in motion when Nonie buys a sweater and several skirts made by Crow, a Ugandan refuge who she knows through her friend Edie. I was quickly swept up in a story of fashion and friendship. I think any reader who’s into clothes will enjoy the descriptions of Nonie’s outfits and Crow’s creation. At first, Nonie and Jenny both seemed a little bit shallow to me. Nonie seemed to think that she was always superior to Jenny and Edie in some way, but thankfully her character wasn’t static. Crow’s story had a few small plot holes. She spent all of her time designing, and even though Bennett did mention that her reading skills improved, it never seemed like she was doing homework, which is odd because she was in school. However, I think the most important aspect of her story was the fact that it brought the plight of other children in her situation to light. There is an author’s note at the end of the story about how you can help, but for those who haven’t read the book, I recommend checking out the websites Save the Children and Invisible Children. Sequins, Secrets, and Silver Linings is the perfect balance of light and serious. Teenagers and pre-teens who love fashion will gobble this book up, and also become more aware in the process. The perfect dose of girly fun, I’m eager to read future installments in this series.